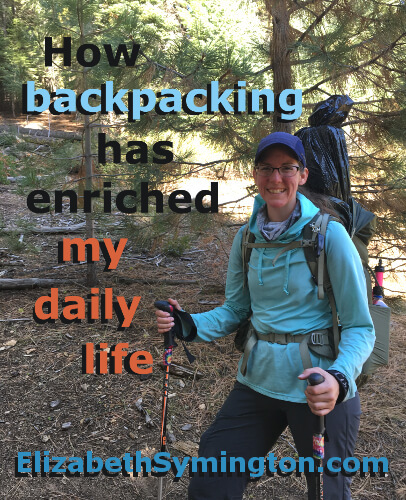 This is Day 16 of the 31 day series on “How backpacking has enriched my daily life.” I expected lightweight backpacking to be a hobby. Instead it has transformed me for the better. Back in 2014, I covered 2,600 miles over 28 days on my Suzuki SV1000 motorcycle. 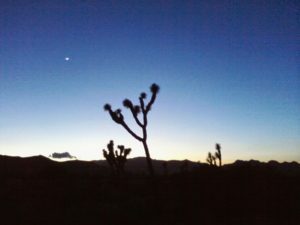 The theme for the road trip was to face my fears: of not having an itinerary, possibly being attacked by wild animals, camping solo and of the dark… I didn’t want fear to make decisions for me, so I intentionally did the things that scared me. By the end of the road trip my fear was less intense, but still present. I’m a work in progress. Then a few years later I moved to Yosemite where I lived and worked in Yosemite Valley. I would get off work late and I’d have to wait for the shuttle bus to take me back to the dorms, because I was too afraid to walk the mile in the dark alone, even with a flashlight. The pivitol moment for getting over a big chunk of my fear of the dark was after I attended a presentation by world famous rock climber Ron Kauk. In his documentary called Return to Balance: A Climber’s Journey, he recommended to focus on being grateful for all living things, that way there wouldn’t be room in your heart for fear. After the presentation I tested out his idea and I tried walking home alone in the dark. Whenever the shadows started to spook me, I’d tell myself that I was thankful for all living things: be it the spooky trees or the mountain lions. I not only walked by myself to the dorms, but I also didn’t use a flashlight! Having the right mind set it key! Thank you Mr. Kauk for your words of wisdom. Every time I go backpacking or camping I push myself to become a more confident woman. I’m still nervous every time I sleep alone outside. 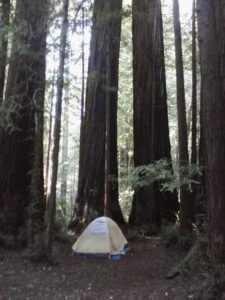 In fact, I still haven’t gone on a solo backpacking trip. Twice now I’ve tried to go on a solo trip, only to have other backpackers that I met on trail decide to camp out where I had pitched my tent. I must admit that I was very grateful for the company! The confidence to face my fear of the dark has spilled over to other areas of my life, like how I carry myself and my interactions with people. I’m also less nervous around town, like when I’m walking to my car at night. I look forward to seeing how much more I’ll continue to grow with my trust in others and for the unknown.